Fall is a nostalgic time, when we long for familiar comfort food. Nothing is more filling and heartier than meatloaf. However, if you’re following a vegan, gluten-free diet, like we are, you’ll want to forgo meat in favor of this savory lentil loaf. It’s moist, satisfying, and, frankly, much tastier than the carnivorous version. Try it, we think you’ll agree. Boil lentils in water or vegetable broth for half hour until they are soft enough to mash with a fork. Drain them and pour into large mixing bowl. Meanwhile, fry onions and garlic in olive oil for 3-5 minutes, until they are lightly browned. Your kitchen will smell wonderful, and you’re just getting started! Mash lentils thoroughly with fork or spatula, then pour the onion/garlic mixture into the bowl with them. Add the spices, rice, ¼ cup ketchup or barbeque sauce, and the additional olive oil, and stir until ingredients become a savory mash. Grease a large baking pan with more olive oil and spread mixture inside. 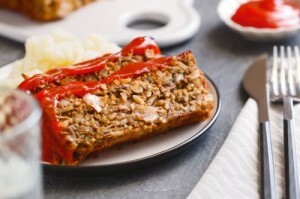 Spoon a layer of ketchup or barbeque sauce across the top of the lentil loaf, making sure it is distributed evenly. Bake at 350 degrees for one hour. Every 20 minutes, briefly remove pan from oven, and spoon or baste an additional thin layer of ketchup or barbeque sauce across the top of the loaf. Serve with your favorite steamed vegetables, a salad, and/or a loaf of gluten-free bread. This amazing dish serves at least 6 people, unless everyone is very hungry. Once you start eating it, you’ll find it quite hard to stop. The loaf keeps well in the refrigerator and makes a nice lunch or reheated snack at home or in the office. It stays moist and fresh for several days. You’ll be glad you took the time to prepare this amazingly inexpensive, delicious meal. Welcome to autumn! Previous Article « Fantastic Burrito Casserole – Naturally Gluten-Free and with Vegan Options!